1) Check everything that's in the box. For those of you who don't follow me on Google+, I was having real issues this past weekend getting the Chromecast to work on the TV in the basement. 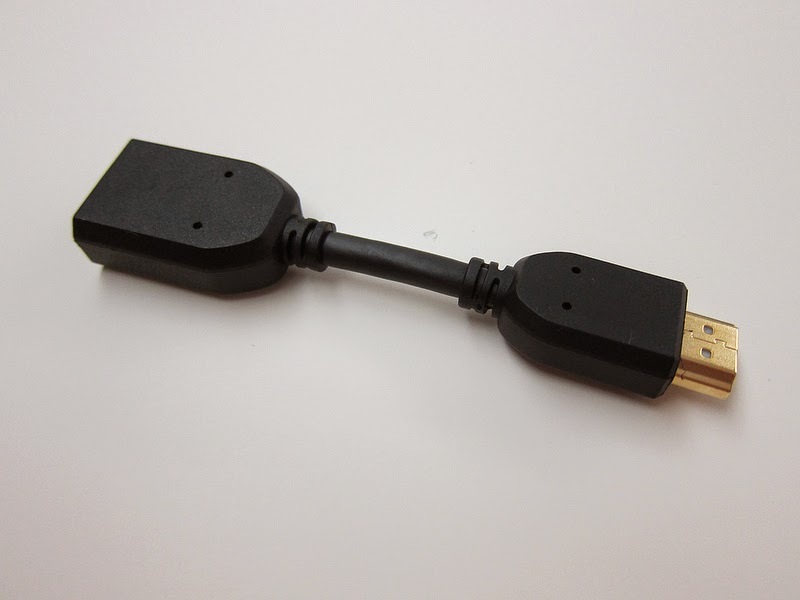 After spending two days troubleshooting the problem, it turned out that I needed to use the HDMI extender (see picture) to get the Chromecast dongle to sit in my HDMI port. The extender... that was still unopened in the box... because I didn't even bother to look at it. The TV in the living room didn't have this issue, fortunately, or I probably would have given up and returned the thing to the store. The fact it did work out of the box (more or less) was a big plus. 2) While I really like my Chromecast, I still can't work up the rationale to get a second one for the finicky basement TV. Up until buying the Chromecast, everything I've been streaming to my TV has gone through my iPad Mini hooked up to Apple's HDMI adapter and run to the HDMI cable to my TV. This works very well and allows me to stream anything I want that I can get on my iPad, even if there's no actual app for it, like New Japan World's service. But it also requires me to find my Apple adapter, get the HDMI cable and hook it all up to my iPad, etc., and it also leaves me without the use of my iPad Mini for as long as I'm streaming. The Chromecast, of course, lets me stream stuff off my iPad without giving up use of said device. But because I'm otherwise in the Apple ecosphere, I can't stream everything from my iPad unless there's a Chromecast compatible app. I can stream stuff of my computer to the TV, but it maxes out at 720p instead of 1080p. And there are a couple of subscription streaming services I get that don't have Chromecast compatible apps yet, so I'm still forced to use my iPad/HDMI combo to get those easily on my basement TV. Which makes me less inclined to buy another Chromecast for the basement that would be used pretty much for my other 2 major Chromecast compatible streaming services, UFC Fight Pass and Netflix. Of course, this would all be much more simple if I had an Apple TV. 3) But neither can I work up the rationale to get Apple TV so I can AirPlay stuff. And this may just be because I'm fundamentally cheap, but having spent the money a year or so ago for the HDMI adapter and another HDMI cable, I'm loathe to just never use it again and spend another $109 plus tax on an Apple TV just so I can AirPlay stuff from my iPad for what amounts to those other two streaming services. Really, in the end, what I want is for enough streaming services to become Chromecast app friendly enough to justify me buying a second Chromecast. Because even a second one - and almost a third one - is still less expensive than one Apple TV.